Muhammad Ali famously commented that he hated every minute of training, “Don’t quit. Suffer now and live the rest of your life as a champion,” he said. His ability to see things in the long-term, looking at the bigger picture rather than short-term accomplishments would help Ali become the most famous athlete of all time, the only man to become the three-time heavyweight champion of the world, who many simply refer to as ‘the greatest’. Growing up in 1950’s Louisville, Cassius Clay Jnr was fun-loving yet purposeful, mischievous but astute. At the age of 12, he had his bike stolen at a local fair. Upon reporting the incident to Joe Martin, a policeman who happened to be training an amateur boxing team at the local gym, Clay said, “I’m gonna whip him if I can find him.” Martin suggested that Clay should first learn how to fight and offered him the chance to take up boxing. By the age of 18, Cassius Clay was the finest amateur boxer in the world, winning the 1960 light-heavyweight Olympic gold medal. Four years later he would join the Nation of Islam, change his name to Muhammad Ali and beat Sonny Listen to win the Heavyweight Championship of the World. But this was just an early step on his path to greatness. 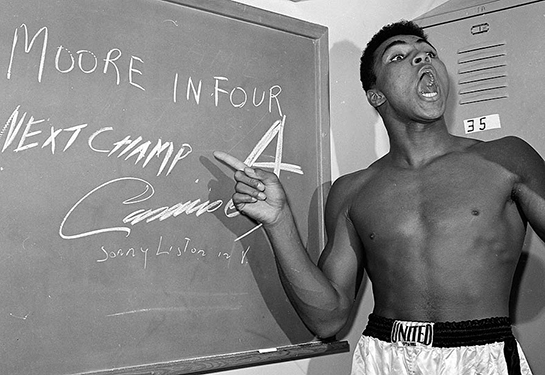 Few will come close to the Ali’s achievements, but the methods he used to reach such dizzying heights, both in and out of the ring were built around four fundamental principles we’re all capable of adopting into our life. 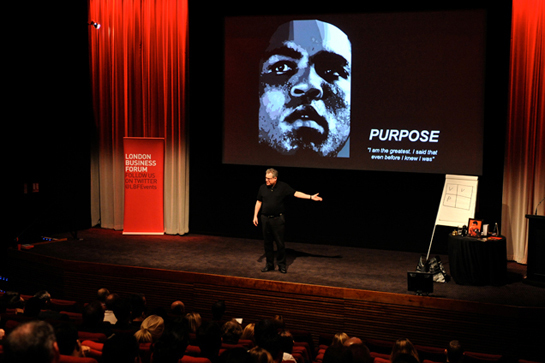 This was Steve McDermott’s message to the London Business Forum at Bafta headquarters. Steve is a three times winner of the European Motivational Speaker of the Year Award and author of international best-selling personal development book, How to be a Complete and Utter Failure in Life, Work and Everything: 44 1/2 Steps to Lasting Underachievement. Ali’s stand for freedom outraged a nation but inspired a generation. He was stripped of his title, handed a $10,000 fine and sentenced to five years in jail – a sentence he never actually served. Ali was a man of strict, non-negotiable personal values, a trait Steve believes is critical to an individual’s success. “The first point is to identify what your values are, and secondly, if there’s only one point you take from this round, it’s that values are non-negotiable – That’s the key,” said Steve. Values within an organisation help shape the conduct of its staff, along with its relationship with the outside world, but Steve believes that values are equally as important to an individual. “How many people in the room as an organisation have some values? How many people have some values outside of work?” He asked the room. “A great person is shaped by their values and the strength of integrity in which their life is led by them. If the path to greatness is a long one, then values help shape our behaviours throughout the journey,” explained Steve. But Ali’s values alone were not enough to take him to greatness. They had to be backed up by a clear view of where he was going, combined with the ability to get others to buy into his vision. For this, Steve believes Ali was a genius. In 1962, Ali fought the sharp-punching veteran Archie Moore. Before the fight, Ali poetically predicted “Archie Moore must fall in four”. This irritated Moore, who responded by saying he had developed a new punch especially for the fight called ‘The Lip Buttoner’. But Ali was correct and defeated Moore with a fourth round knockout, true to his word. Ali called this “future history”, a powerful visualisation technique which he used to programme his mind for success in the ring. Steve has been using a similar technique for the past 20 years and encouraged audience members to do the same. He explained how this activity encourages us to emotionally engage with our future achievements, increasing the likelihood of them actually happening. 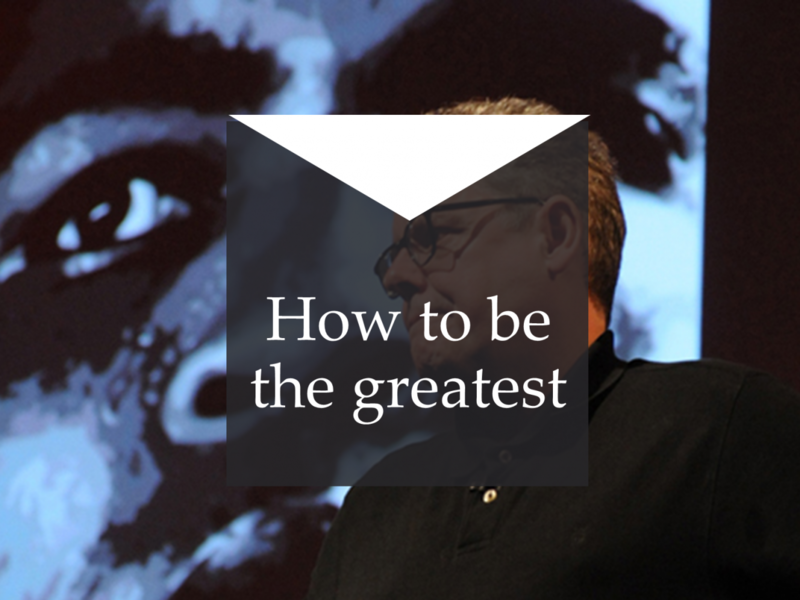 Like Ali, future-orientated people have a vision which they’re clear on, but this only counts for about ten percent of people according to Steve who explained that the other 90 percent of people find themselves stuck in the now and the past. He believes this is because most people consider themselves victims of circumstance, whereas a small minority are different. Like Ali, they take full accountability of their actions. He went on to explain that a mission statement can act as a solid foundation and give an individual a greater sense of purpose. Muhammad Ali’s was simply: “I am the greatest”, an aspirational statement which Steve linked this to his own experience. Starting out as a professional speaker, Steve decided he would tell people that he was one of the top ten motivational speakers in the UK. At the time this was untrue, yet no one picked him up on it. Before long Steve was recognised as one of the best motivational speakers in the country. And why stop there? Soon after, Steve started telling people he was one of the top ten motivational speakers in Europe, leading him to secure a number of speaking gigs around Europe and win the European Motivational Speaker of the Year award three times. Throughout his career, Ali used goals help give clarity to his values, vision and purpose, and Steve’s final task helped highlight his final point about the importance of setting positive goals. He believes that the mere process of writing down a goal can go a long way in making it actually happen, slotting the idea into one’s subconscious. “Only three percent of people bother to think about their goals and actually write them down. But if you do, there’s an 80 percent chance that it will actually happen.” He said. 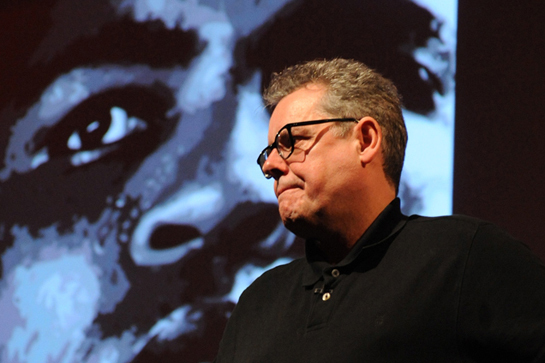 Steve ended his presentation with an epilogue, describing the time Ali fought Yorkshireman, Richard Dunn in Munich. A week before the fight, promoter, Mickey Duff, asked Ali if he could have his gloves to auction off at a benefit dinner for British fighter Chris Finnegan who had lost an eye. Ali agreed and immediately after the fight, Duff jumped into the ring to get the gloves, afraid Ali may have forgotten his promise. Ali’s cornerman, Angelo Dundee handed the gloves to Duff, who walking away, felt a tap on his shoulder. It was Ali, who said to Duff “look inside the gloves”. In one glove it said, ‘Ali wins’ in the other glove it said ‘KO, round 5’. By this point Ali had stopped predicting fights publicly, but he wanted to do a something extra for Chris Finnegan. “Wherever he went, whoever he was with Ali’s generosity was evident,” commented Duffy. Ali knew his purpose, was clear with his vision and unwavering in his values. His legacy transcended the world of sport, allowing him to create a world for himself which allowed him to express himself like no other man of his time. Steve’s presentation perfectly highlighted the points he believes all companies and individuals should possess in order to achieve greatness. More than the sum of its parts, it’s the cumulative effect, relying on the fundamental elements; value, vision, purpose and goals. For further information on the London Business Forum please click here.